Pubic lice (also called crab lice or "crabs") are parasitic insects found primarily in the pubic or genital area of humans. Pubic lice may occasionally be found on other coarse body hair, such as hair on the legs, armpits, mustache, beard, eyebrows, or eyelashes. Lice found on the head are generally head lice, not pubic lice. Signs and symptoms of pubic lice include itching in the genital area and visible nits (lice eggs) or crawling lice. Pubic lice usually spread through sexual contact and are most common in adults. Pubic lice found on children may be a sign of sexual exposure or abuse. Pubic lice may be spread by close personal contact or contact with articles such as clothing, bed linens, or towels that have been used by an infested person. Treatment for public lice includes a lice-killing lotion containing 1% permethrin or a mousse containing pyrethrins and piperonyl butoxide. These products are available over-the-counter without a prescription. Also called crab lice or "crabs," pubic lice are parasitic insects found primarily in the pubic or genital area of humans. Pubic lice infestation is found worldwide and occurs in all races, ethnic groups, and levels of society. Pubic lice have forms: the egg (also called a nit), the nymph, and the adult. Nit: Nits are lice eggs. They can be hard to see and are found firmly attached to the hair shaft. They are oval and usually yellow to white. Pubic lice nits take about 6-10 days to hatch. Nymph: The nymph is an immature louse that hatches from the nit (egg). A nymph looks like an adult pubic louse but it is smaller. Pubic lice nymphs take about 2-3 weeks after hatching to mature into adults capable of reproducing. To live, a nymph must feed on blood. Adult: The adult pubic louse resembles a miniature crab when viewed through a strong magnifying glass. Pubic lice have six legs; their two front legs are very large and look like the pincher claws of a crab. This is how they got the nickname "crabs." Pubic lice are tan to grayish-white in color. Females lay nits and are usually larger than males. To live, lice must feed on blood. If the louse falls off a person, it dies within 1-2 days. Adult pubic lice are 1.1-1.8 mm in length. Pubic lice typically are found attached to hair in the pubic area but sometimes are found on coarse hair elsewhere on the body (for example, eyebrows, eyelashes, beard, mustache, chest, armpits, etc.). Pubic lice infestations (pthiriasis) are usually spread through sexual contact. Dogs, cats, and other pets do not play a role in the transmission of human lice. Both over-the-counter and prescription medications are available for treatment of pubic lice infestations. SOURCE: Centers for Disease Control and Prevention. 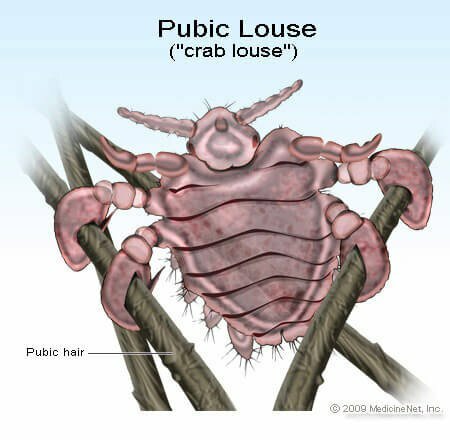 Pubic "Crab" Lice Fact Sheet. 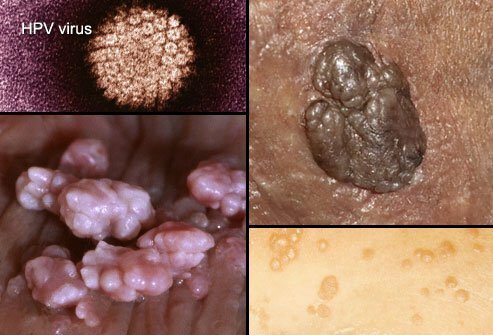 Pubic lice usually are found in the genital area on pubic hair; but they may occasionally be found on other coarse body hair, such as hair on the legs, armpits, mustache, beard, eyebrows, or eyelashes. Pubic lice on the eyebrows or eyelashes of children may be a sign of sexual exposure or abuse. Lice found on the head generally head lice, not pubic lice. Pubic lice usually are spread through sexual contact and are most common in adults. Pubic lice found on children may be a sign of sexual exposure or abuse. Occasionally, pubic lice may be spread by close personal contact or contact with articles such as clothing, bed linens, or towels that have been used by an infested person. A common misunderstanding is that pubic lice are spread easily by sitting on a toilet seat. This would be extremely rare because lice cannot live long away from a warm human body and they do not have feet designed to hold onto or walk on smooth surfaces such as toilet seats. Persons infested with pubic lice should be investigated for the presence of other sexually transmitted diseases. A pubic lice infestation is diagnosed by finding a "crab" louse or egg (nit) on hair in the pubic region or, less commonly, elsewhere on the body (eyebrows, eyelashes, beard, mustache, armpit, perianal area, groin, trunk, scalp). Pubic lice may be difficult to find because there may be only a few. Pubic lice often attach themselves to more than one hair and generally do not crawl as quickly as head and body lice. If crawling lice are not seen, finding nits in the pubic area strongly suggests that a person is infested and should be treated. If you are unsure about infestation or if treatment is not successful, see a health care provider for a diagnosis. Persons infested with pubic lice should be investigated for the presence of other sexually transmitted diseases. A lice-killing lotion containing 1% permethrin or a mousse containing pyrethrins and piperonyl butoxide can be used to treat pubic ("crab") lice. These products are available over-the-counter without a prescription at a local drug store or pharmacy. These medications are safe and effective when used exactly according to the instructions in the package or on the label. Malathion* lotion 0.5% (Ovide*) is a prescription medication that can kill lice and some lice eggs; however, malathion lotion (Ovide*) currently has not been approved by the U.S. Food and Drug Administration (FDA) for treatment of pubic ("crab") lice. Ivermectin has been used successfully to treat lice; however, ivermectin currently has not been approved by the U.S. Food and Drug Administration (FDA) for treatment of lice. To kill any lice or nits remaining on clothing, towels, or bedding, machine-wash and machine-dry those items that the infested person used during the 2-3 days before treatment. Use hot water (at least 130°F) and the hot dryer cycle. Repeat treatment in 9-10 days if live lice are still found. If additional treatment is needed for lice or nits on the eyelashes, careful application of ophthalmic-grade petrolatum ointment (only available by prescription) to the eyelid margins 2-4 times a day for 10 days is effective. Regular Vaseline* should not be used because it can irritate the eyes if applied. *Use of trade names is for identification purposes only and does not imply endorsement by the Public Health Service or by the U.S. Department of Health and Human Services. What kinds of treatment, including medication, did you or your partner receive for public lice (crabs)? What were the symptoms associated with pubic lice in you or your partner? Have you ever been diagnosed with "crabs" or pubic lice? Please share your experience. Parasitic insects found in the genital area of humans. See a picture of Crabs (Pubic Lice) and learn more about the health topic. Malathion (Ovide) is a prescription drug used to treat individuals with head lice and their eggs. Side effects, drug interactions, storage, and pregnancy and breastfeeding safety information should be reviewed prior to taking any medication.